McKinley was born in Ohio, fought as a major in the Union Army during the Civil War and afterwards becqame an attorney. He became a Republican congressman and Governor of Ohio in 1891 and 1893, before being elected President in 1896. 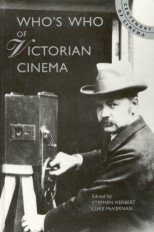 His five years in office saw the rise of motion pictures in America and himself as a frequent subject for them. W.K-L. Dickson's McKinley at Home, Canton, O. (1896) showed the then presidential candidate walking across his lawn with his son. One of the very first Biograph titles to be exhibited, and the star attraction of the official opening programme on 12 October 1896 at Hammerstein's Olympia Music Hall, the film caused great excitement, by its topicality (the event was virtually a Republican party rally) and the startling clarity of the Biograph image (McKinley also had a family connection with Biograph - his brother Abner was one of the original investors in the American Mutoscope and Biograph Company). McKinley's inauguration was a major news event given extensive coverage by Biograph, Edison and Lumière, the latter firm coming towards the end of its time in the country. 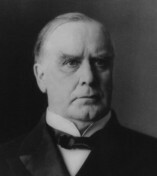 McKinley's term in office was dominated by the Spanish-American war of 1898, which in turn became an important early newsfilm story. McKinley won a second term in 1900, then on 5 September 1901, during a visit to the Pan-American Exposition at Buffalo, New York, he was assasinated by the anarchist Leon Czolgosz. James White's Edison camera team were out in force and captured a remarkable series of news pictures recording the unfolding events, from McKinley reviewing reviewing the guard of honour and making a speech, to the puzzled and angry crowd captured in a panning shot as the news spread of the assassination. To add to their funeral films, Edison staged a recreation of the electrocution of Czolgosz, hence making a complete documentary of the assassination. McKinley's successor, Vice President Theodore Roosevelt (1858-1919) was to become the first media-friendly politician of the new century, actively supporting and encouraging the new art and proving extremely adept at adopting it for self-promotion.